The last chance to defeat proposals for damaging hydropower schemes in Glen Etive has now gone. Following The Highland Council�s decision to approve the three contentious applications in wild land areas in the glen, Mountaineering Scotland wrote to the Minister for Local Government, Housing and Planning and to the Chief Planner to the Scottish Government asking for a review. However a letter now received from the Chief Planner indicates that The Highland Council�s decision stands. The Chief Planner said in his letter that, while Scottish Ministers do have powers to intervene in certain planning applications, they do so sparingly, and only where significant issues of national importance arise. When they looked into the proposals at Glen Etive to consider whether call-in was appropriate, they did not consider that the issues raised were of sufficient national significance to warrant their intervention. Mountaineering Scotland is obviously disappointed that all seven hydropower schemes were approved. An acceptable compromise would have been for four schemes to go ahead in the already developed part of the glen, and save the wilder slopes below the eastern watershed from intrusive heavy engineering. This is not to be. 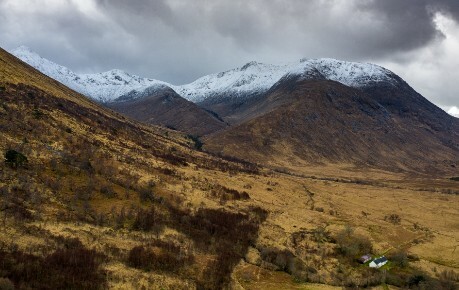 What now for Glen Etive in particular and protection of our wilder landscapes in general? Mountaineering Scotland will review with the Save Glen Etive campaign group how the campaign went. Also, there is the practical matter of the digging up and reinstatement of the three burns for the hydropower schemes, and how that is monitored. Mountaineering Scotland will also seek a meeting with Scottish Natural Heritage. SNH did not lodge objections to any of the proposals, and we wish to understand how SNH assess proposals on landscape and wild qualities, and what the threshold would have to be to trigger an objection. Mountaineering Scotland thanks all our members who wrote to Councillors and MSPs expressing their concerns, and we look now to continuing a wider discussion on how rural communities may be supported while protecting the qualities of landscape that we all can enjoy. Ben Starav. Photo by Richard Cross.